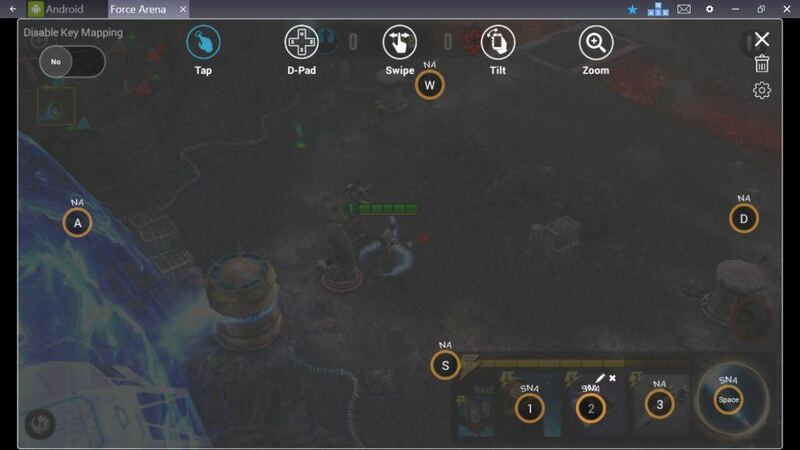 Star Wars: Force Arena is an RPG to lead a team of heroes from the Star Wars universe to battle and conquest. You can strategize solo or invite friends to fight in Guild mode to defend a chosen faction. 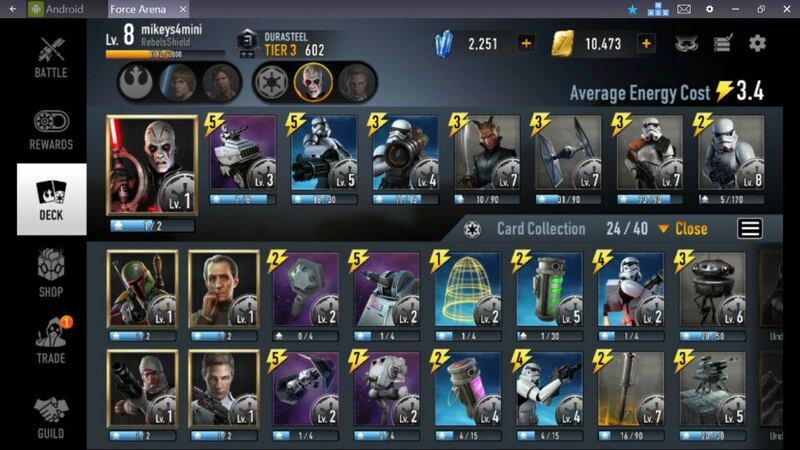 Collect character cards and upgrade your favorites to create the ideal Rebel or Imperial squad. Command powerful duos such as Han Solo and Chewbacca whom boost effectiveness in combat. 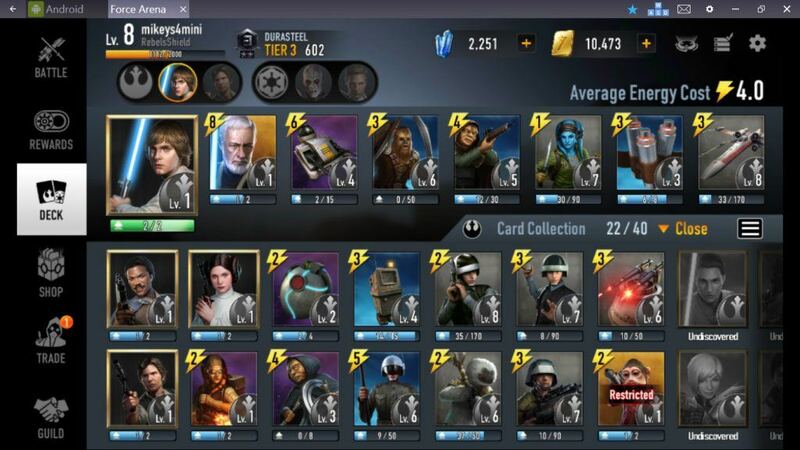 In this Star Wars: Force Arena game guide for PC you will learn of strategies implored by one of our avid gamers in our Community whose screen name is mikeys4mini. I’ve actually been playing this game for a few weeks since it’s launch. I’m currently level 8 right with the following stats: 782 points, 2,245 Diamonds, 13,458 Gold Bars and I’m apart of the RebelsShield guild. I’ve been easily playing with the mouse although I know it would be easier with the mappings. The thing here is that we don’t have an area to put the WASD key mappings on, so putting them anywhere on the map wouldn’t work. I’ve been putting some mappings for the special attack (Space) and for one of the 3 upcoming cards that are currently available. I’ve mapped them with Q, W and E keys so I can have only one hand on the keyboard. The strategy of movement is simple, you click anywhere on the map, double-click to get there faster. You can also drag the map around to see. There’s also a zoom out button when battling. My strategy would be to collect the unique cards as soon as possible. Each leader has one of which completes them. I’ve been playing with Luke Skywalker but when completing the mission rewards you will have to choose which reward cards do you want. Also, you can tap a target you want to attack, and the leader will focus on it. The major goal to winning is to destroy your opponent’s base, or destroy the most turrets before time ends. You can deploy your troops on any of your highlighted area. You can’t see on the mini-map what your enemy deploys, only the red circle, but once you get close to the target you’ll figure out. My strategy always starts deploying something on the left side of the map then attacking on his right side. He would eventually go after my first target, but by then I am already destroying his right turret. Of course this doesn’t work all of the time, however, even if you get the chance to blow one of his turrets, if he has higher cards than you it’s better to protect your base rather than continuing attacking him because at the end of the match you will still get 3 stars for victory. For new players it will be hard remembering which character is best and opposes well against others. When building the deck you can see this info on each card. It’s best to have powerful high energy cards but also low energy ones too (I use them sometimes as a distraction). The game offers a lot of freebies, so it’s important to login daily or check notifications so you won’t miss them. I received a lot of crystals during pre-registration and daily bonus for some events. I recommend not to upgrade the leader card because you won’t have anything left to spend. When you upgrade the cards, even those that you don’t use and even the ones from the Dark side you get XP. And when you level up your buildings get additional health, so upgrade them all! Also, login to open the free packs. You get one every four hours but you can’t store more then three. If you login twice a day you will build up some nice cards. When winning a game you will also get a victory pack but this unlocks within few hours. When you reach 10 stars from battles you get another Play pack which opens instantly. From the Shop, I only recommend the diamond pack. It’s really worth it rather than the low diamond packs. This is my strategy and I hope you find it helpful. Please comment below if you have any questions or concerns.